When you let someone into your home, you need to know that they are skilled professionals. Our team of Domestic Engineers are fully trained, accredited and experienced. 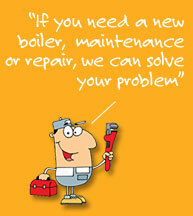 Whether you need a new boiler, maintenance or repair, we can solve your problem. Central heating is an area of speciality, where we can offer you the most cost-effective and energy saving solutions. You can also rely on us for swimming pool boiler installation, service, maintenance and repair. Check the Swimming pool link for more information on our extensive service.